First Line: There is near complete darkness, yes, but it's the least of my problems. Ex-FBI agent Brigid Quinn has left the psychos behind her. She enjoys her life in Tucson, Arizona, with her new husband, her friends, and her volunteer work teaching self-defense at a women's shelter. All she wants to do is to concentrate on this sweet new life, but she just can't seem to catch a break. When her sister-in-law dies, Brigid takes in her seventeen-year-old niece, Gemma Kate. When Gemma Kate moves in, Brigid's life begins to unravel. There's something unsettling about the young girl, and when Brigid promises a couple to help investigate the death of their son, that isn't as simple as she thought it would be. All of a sudden her house is no longer a haven, and danger-- including murder-- seems to lurk around every corner. Once again, Becky Masterman begins a book by putting her main character in a very scary situation. This time, the situation is sometime in the near future. Then she takes readers back to the present so we can wonder how Brigid got herself into that mess. As the story progresses, we see how it happened... and now it's time for us to wonder how she's going to get herself out of danger. It's a formula that works, due almost entirely to the strength of the tough, smart, older woman, Brigid Quinn. In Fear the Darkness, we're seeing Brigid when she isn't at her best. What's wrong with her? Is she imagining things? Is Gemma Kate a psychopath? Is the death of the couple's young son really suicide, or is it murder? Masterman poses a lot of questions throughout the story, and discovering the answers turns out to be a most enjoyable undertaking. It's always fascinating to me to wonder if a strong, intelligent character has suddenly turned into an unreliable narrator, and if so, to deduce the reason why. The only thing that slightly marred the book for me was the fact that I deduced the villain of the piece much too early. I have a nose for certain elements in a mystery. (For example, if someone's dead, I want to "see" the body.) 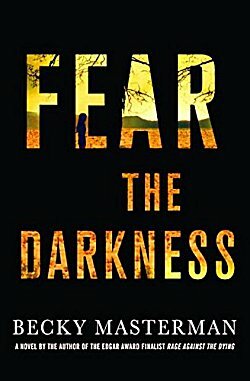 But even though I knew whodunit, Fear the Darkness is still an excellent study of personalities and a thrilling, fast-paced tale to read. Brigid is a marvelous character who is incapable of giving up. Bring on book three! This one sounds as though it's got some solid psychological elements, Cathy, along with the actual crime plot. That can be really intriguing and even eerie when it's done well. Glad you enjoyed this. Yes, there was less to-ing and fro-ing in this one and more delving into the minds of various characters. I enjoyed it very much. This one sounds good. Do I dare add one more book to the TBR mountain range? It's peculiar how ex-cops, agents, investigates still find themselves up to their necks in murder, isn't it? I found this with Peter May's Fin MacLeod, but it's a common phenomenon in crime fiction. Once they show a talent for catching monsters, they're in the "business" for life, it seems.